David Bowie (pronounced /ˈboʊiː/ - born David Robert Jones, January 8, 1947 - January 10, 2016) was an English musician, singer-songwriter, actor, producer, arranger, and audio engineer. Active in five decades of rock music and frequently reinventing both his music and image, Bowie is regarded as an influential musical innovator. Bowie first caught the eye and ear of the public in the autumn of 1969, when his space-age mini-melodrama "Space Oddity" reached the top five of the UK singles chart. In 1972, his seminal concept album The Rise and Fall of Ziggy Stardust made Bowie's androgynous persona famous. In 1975, he achieved his first major American success with the number-one single "Fame" and the hit album Young Americans. He then confounded the expectations of both his record label and his American audiences by recording the minimalist album Low, the first of three collaborations with Brian Eno. He scored a major hit in 1983 with "Let's Dance," which went to number one in both the United States and United Kingdom and is now considered a classic. The innovative 1984 video "Jazzin' for Blue Jean" won Bowie a Grammy Award for Best Short Form Music Video. Bowie also achieved success as a stage and film actor, notably in the 1976 movie The Man Who Fell to Earth. He was inducted into the Rock and Roll Hall of Fame at the eleventh annual induction ceremony in 1996. In 2006, he was awarded the Grammy Lifetime Achievement Award. Bowie was born David Robert Jones in Brixton, south London, on January 8, 1947. His mother, Margaret Mary "Peggy" (née Burns), was from Kent, the daughter of poor Irish immigrants who had settled in Manchester. She worked as a waitress while his father, Haywood Stenton "John" Jones, from Yorkshire, was a promotions officer for the children's charity Barnardo's. The family lived near the border of the south London areas of Brixton and Stockwell. Bowie attended Stockwell Infants School until he was six years old, acquiring a reputation as a gifted and single-minded child—and a defiant brawler. In 1953, Bowie moved with his family to the suburb of Bromley, where, two years later, he progressed to Burnt Ash Junior School. His voice was considered "adequate" by the school choir, and he demonstrated above-average abilities in playing the recorder. At the age of nine, his dancing during the newly introduced music and movement classes was strikingly imaginative. The same year, his interest in music was further stimulated when his father brought home a collection of American 45s by artists including Frankie Lymon and the Teenagers, the Platters, Fats Domino, Elvis Presley, and Little Richard. By the end of the following year he had taken up the ukulele and tea-chest bass and begun to participate in skiffle sessions with friends, and had started to play the piano; meanwhile his stage presentation of numbers by both Presley and Chuck Berry—complete with gyrations in tribute to the original artists—to his local Wolf Cub group was described as mesmerizing. After taking his eleven plus exam at the conclusion of his Burnt Ash Junior education, Bowie went to Bromley Technical High School. Despite its status it was, by the time David arrived in 1958, as rich in arcane ritual as any [English] public school. There were houses, named after eighteenth-century statesmen like Pitt and Wilberforce. There was a uniform, and an elaborate system of rewards and punishments. There was also an accent on languages, science and particularly design, where a collegiate atmosphere flourished under the tutorship of Owen Frampton. In David's account, Frampton led through force of personality, not intellect; his colleagues at Bromley Tech were famous for neither, and yielded the school's most gifted pupils to the arts, a regime so liberal that Frampton actively encouraged his own son, Peter, to pursue a musical career with David, a partnership briefly intact thirty years later. ~ Christopher Sandford, Bowie: Loving the Alien (Time Warner, 1997), 21–22. Bowie studied art, music and design, including layout and typesetting. After Terry Burns, his half-brother, introduced him to modern jazz, his enthusiasm for players like Charles Mingus and John Coltrane led his mother to give him a plastic alto saxophone in 1961; he was soon receiving lessons from a local musician. An admitted bi-sexual, Bowie met his first wife Angela Bowie in 1969. They married on March 19, 1970 at Bromley Register Office in Beckenham Lane, Kent, England where she permanently took his adopted last name. Their son was born on May 30, 1971 and named Zowie. They separated after eight years of marriage and divorced in 1980. Bowie married his second wife, the Somali-born supermodel Iman Abdulmajid, in 1992. The couple had a daughter, Alexandria Zahra Jones (known as Lexi), born August 15, 2000. They lived in Manhattan and London. Bowie died on January 10, 2016, two days after releasing the album Blackstar on his 69th birthday, from liver cancer at his New York home. He had been diagnosed with the malignancy eighteen months previously. David Robert Jones was born in Brixton, London, to a father from Tadcaster in Yorkshire and a mother from an Irish family; his parents were married shortly after his birth. When he was six years old, his family moved from Brixton to Bromley in Kent, where he attended the Bromley Technical High School. Little Richard was an early major influence on Bowie. Bowie's interest in music was sparked at the age of nine when his father brought home a collection of American 45s, including Fats Domino, Chuck Berry, and Little Richard. Upon listening to "Tutti Frutti," Bowie would later say, "I had heard God." (Doggett, 2007, 8-9.) His half-brother Terry introduced him to modern jazz. He formed his first band in 1962, the Konrads and then played with various blues/beat groups, such as the King Bees, the Manish Boys, the Lower Third, and the Riot Squad, releasing his first single, "Liza Jane," with the King Bees in 1964. His early work shifted through the blues and Elvis-inspired rock while also working with many British pop styles. Having changed his name from David Jones to avoid being confused with the lead singer of the Monkees, Bowie released his first album in 1967 for the Decca Records offshoot Deram. Simply called David Bowie, it was an amalgam of pop, psychedelia, and theatrical music. Influenced by the dramatic arts, he studied avant-garde theatre, mime, and Commedia dell'arte with British choreographer Lindsay Kemp, and much of his work would involve the conscious creation of personae to present to the world. During 1967, Bowie sold his first song to another artist, "Oscar" (an early stage name of actor-musician Paul Nicholas). Bowie's first brush with fame came in 1969 with his single "Space Oddity," written the previous year but recorded and released to coincide with the first moon landing. It became a Top 5 UK hit. The corresponding album, his second, was originally titled David Bowie, like his first, but was re-released by RCA Records as Space Oddity in 1972. In 1970 Bowie released his third album, The Man Who Sold the World, rejecting the acoustic guitar sound of the previous album and replacing it with the heavy rock backing provided by Mick Ronson, who would be a major collaborator through to 1973. Much of the album resembles British heavy metal music of the period, but the album provided some unusual musical detours, such as the title track's use of Latin sounds and rhythms. The original UK cover of the album showed Bowie in a dress, an early example of his androgynous appearance. His next record, Hunky Dory (1971), featured such light fare such as the droll "Kooks," but also explored more serious themes such as "Oh! You Pretty Things," the semi-autobiographical "The Bewlay Brothers," and the Buddhist-influenced "Quicksand." Hunky Dory was not a big hit at first, but it laid the groundwork for the move that would shortly lift Bowie into the first rank of stars, giving him four top-ten albums and eight top ten singles in the UK in 18 months between 1972 and 1973. 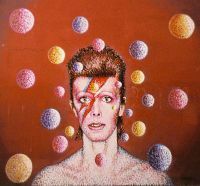 Mural in Bowie's hometown of Brixton, south London, is taken from his character in Aladdin Sane. Bowie's androgynous persona was further explored in June 1972 with the seminal concept album The Rise and Fall of Ziggy Stardust and the Spiders from Mars, which presents a world destined to end in five years and tells the story of the ultimate rock star. The Ziggy Stardust character became the basis for Bowie's first large-scale tour beginning in 1972, where he donned his famous flaming red hair and wild outfits. The tour's success made Bowie a star, and soon the six-month-old Hunky Dory was eclipsed by Ziggy Stardust, when it peaked at number three on the UK chart. His Aladdin Sane album topped the UK chart in 1973, his first number one album. Described by Bowie as "Ziggy goes to America," it contained songs he wrote while traveling to and across the US during the earlier part of the Ziggy tour, which then continued to Japan to promote the new album. Aladdin Sane spawned the UK top five singles "The Jean Genie" and "Drive-In Saturday". Around the same time Bowie began promoting and producing his rock and roll heroes including former Velvet Underground singer Lou Reed's solo breakout album Transformer, Mott the Hoople's fifth album and title track, All the Young Dudes, and Iggy Pop's band The Stooges' third album Raw Power. Iggy Pop later reciprocated by writing the song China Doll in consideration for Bowie's assistance. It can be argued that Bowie's attention and support either launched, in the case of Reed and John Mellancamp, or saved, in the case of Mott the Hoople's and Iggy Pop's, performance careers. It has been noted by some that Bowie used his influence with Tony DeFries at Mainman Studios and the studio became a magnet for aspiring performance artists such as John Mellancamp, known then as Johnny Cougar. The year 1974 saw the release of another ambitious album, Diamond Dogs, with a spoken word introduction and a multi-part song suite ("Sweet Thing/Candidate/Sweet Thing (reprise)"). Diamond Dogs was the product of two distinct ideas: a musical based on a wild future in a post-apocalyptic city, and setting George Orwell's 1984 to music. Bowie also made plans to develop a Diamond Dogs movie, but the project did not materialize. Bowie's 1975 Young Americans was his definitive exploration of Philly soul—though he himself referred to the sound ironically as "plastic soul." It contained his first number-one hit in the US, "Fame," co-written with Carlos Alomar and John Lennon, who also contributed backing vocals. 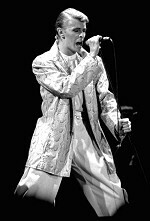 Ziggy Stardust fans who had not discerned the soul and funk strains already apparent in Bowie's work found this "new" sound was considered a sudden and jolting step, but Young Americans was the album that cemented Bowie's stardom in the U.S.
Station to Station (1976) featured a darker version of this soul persona, called "The Thin White Duke." Visually, the figure was an extension of the character Bowie portrayed in the film The Man Who Fell to Earth, Thomas Jerome Newton. Station to Station was a transitional album, prefiguring the Krautrock and synthesizer music of his next releases, while further developing the funk and soul music of Young Americans. The 1976 World Tour featured a starkly lit set and highlighted new songs such as the dramatic and lengthy title track, the ballads "Wild Is the Wind" and "Word on a Wing," and the funkier "TVC 15" and "Stay." 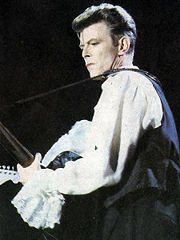 The tour, though highly successful, was also entrenched in controversy, as some in the media claimed that Bowie was advocating fascism, a charge Bowie said resulted from a complete misinterpretation of his essentially anti-fascist message. Bowie's interest in the growing German music scene, as well as his drug addiction, prompted him to move to West Berlin to dry out and rejuvenate his career. Sharing an apartment in Schöneberg with his friend Iggy Pop, he co-produced three more of his own classic albums with Tony Visconti, while aiding Pop with his career. With Bowie as a co-writer and musician, Pop completed his first two solo albums, The Idiot and Lust for Life. Bowie joined Pop's touring band in the spring, playing keyboard and singing backing vocals. The group performed in the UK, Europe, and the US from March to April 1977. Low, the first of three albums that became known as the "Berlin Trilogy," was recorded with Brian Eno as an integral collaborator. Partly influenced by the "Krautrock" sound and the minimalist work of Steve Reich, Bowie journeyed to Neunkirchen near Cologne and recorded new songs that were relatively simple and repetitive, with the second side almost wholly instrumental. The album provided him with a surprise number three hit in the UK aided by the BBC's using the single, "Sound and Vision," as its 'coming attractions' theme music. His next record, Heroes, was similar in sound to Low, though slightly more accessible. The mood of these records fit the zeitgeist of the Cold War, symbolized by the divided city that provided its inspiration. Bowie and his band embarked on an extensive world tour in 1978 that featured music from both Low and Heroes. A live album from the tour was released as Stage the same year. Songs from both Low and Heroes were later converted to symphonies by minimalist composer Phillip Glass. Lodger (1979) was the final album in Bowie's so-called "Berlin Trilogy." The style was a mix of New Wave and world music, including pieces such as "African Night Flight" and "Yassassin." In 1980, Scary Monsters (and Super Creeps) represented a major departure from the Berlin era, and revisiting the character of Major Tom from "Space Oddity." It included the number one hit "Ashes to Ashes," featuring the textural work of guitar-synthesist Chuck Hammer. In 1981, Queen released "Under Pressure," co-written and performed with Bowie. The song was a hit and became Bowie's third UK number one single. Bowie scored a blockbuster hit with Let's Dance in 1983, a slick dance album co-produced by Chic's Nile Rodgers. The title track went to number one in the United States and United Kingdom and many now consider it a standard. 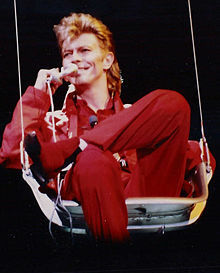 Bowie's next album was originally planned to be a live album recorded on the Serious Moonlight Tour, but EMI demanded another studio album instead. The resulting Tonight (1984), was also dance-oriented, featuring collaborations with Tina Turner and Iggy Pop, as well as various covers, including one of The Beach Boys' "God Only Knows." Critics labeled it a lazy effort, but the album bore the transatlantic top-ten hit "Blue Jean." The associated video, the 21-minute short film "Jazzin' for Blue Jean," reflected Bowie's long-standing interest in combining music with drama. This video would win Bowie his only Grammy to date, for Best Short Form Music Video. In 1986, Bowie acted in and contributed several songs to the film Absolute Beginners. The movie was not well reviewed but Bowie's theme song rose to number two on the UK charts. He also took a role in the 1986 Jim Henson film Labyrinth, as Jareth, the Goblin King who steals the baby brother of a girl named Sarah (played by Jennifer Connelly), in order to turn him into a goblin. Bowie wrote five songs for the film, the script was partially written by Monty Python's Terry Jones. Bowie's final solo album of the 80s was 1987's Never Let Me Down, offering a harder rock sound with an industrial/techno dance edge. The album, which peaked at number six in the UK, contained hit singles "Day In, Day Out," "Time Will Crawl," and "Never Let Me Down." In August of 1988, Bowie portrayed Pontius Pilate in the Martin Scorsese film The Last Temptation of Christ. In 1989, for the first time since the early 1970s, Bowie formed a regular band, Tin Machine, a hard-rocking quartet, along with Reeves Gabrels, Tony Sales, and Hunt Sales. Tin Machine released two studio albums and a live record. The band received mixed reviews and a somewhat lukewarm reception from the public, but Tin Machine heralded the beginning of a long-lasting collaboration between Bowie and Gabrels. The original album, Tin Machine (1989), was a success, holding the number three spot on the charts of the UK. After the less successful second album Tin Machine II and the complete failure of live album Tin Machine Live: Oy Vey, Baby, Bowie tired of having to work in a group setting where his creativity was limited, and finally disbanded Tin Machine to work on his own. But the Tin Machine venture did show that Bowie had learned some harsh lessons from the previous decade, and was determined to get serious about concentrating on music more than commercial success. In 1993 Bowie released Black Tie White Noise, which reunited him with Let's Dance producer Nile Rodgers. The album hit the number one spot on the UK charts with singles such as "Jump They Say" and "Miracle Goodnight." Bowie explored new directions on The Buddha of Suburbia (1993), based on incidental music composed for a TV series. It contained some of the new elements introduced in Black Tie White Noise, and also signaled a move towards alternative rock. The album was a critical success but received a low-key release and only made number 87 in the UK charts. The ambitious, quasi-industrial release Outside (1995), conceived as the first volume in a subsequently abandoned non-linear narrative of art and murder, reunited him with Brian Eno. 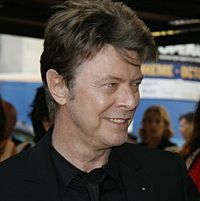 The album introduced the characters of one of Bowie's short stories, and achieved chart success in both the UK and US. Receiving some of the strongest critical response since Let's Dance was Earthling (1997), which included a single released over the Internet, called "Telling Lies." Other singles included "Little Wonder" and "Dead Man Walking." In 1998, a reunion with Tony Visconti led to the pair pursuing a new collaborative effort. Their "(Safe In This) Sky Life" was later re-recorded and released in 2002 where it was retitled "Safe." In the same year, Bowie curated the annual Meltdown festival in London. In September 2003, Bowie released a new album, Reality, and announced a world tour. In October 2004, he released a live DVD of the tour, entitled A Reality Tour of his performances in Dublin, Ireland. Despite hopes for a comeback, in 2005 Bowie announced that he had made no plans for any performances during the year. In 2006, Bowie made a surprise guest appearance at David Gilmour's May 29 concert at the Royal Albert Hall in London. His performance of "Arnold Layne" was released as a single. In 2008, Bowie released a new compilation entitled iSELECT, notable in that it only contained one major hit single, "Life on Mars?," and concentrated on lesser-known album tracks. On January 8, 2013 (his 66th birthday), his website announced a new album, to be titled The Next Day and scheduled for release in March . Bowie's first studio album in a decade, The Next Day contains 14 songs plus 3 bonus tracks. Record producer Tony Visconti said 29 tracks were recorded for the album, some of which could appear on Bowie's next record, which he might start work on later in 2013. The announcement was accompanied by the immediate release of a single, "Where Are We Now? ", written and recorded by Bowie in New York and produced by longtime collaborator Tony Visconti. A music video for "Where Are We Now?" was released onto Vimeo the same day, directed by New York artist Tony Oursler. The single topped the UK iTunes Chart within hours of its release, and debuted in the UK Singles Chart at No. 6, his first single to enter the top 10 for two decades, (since "Jump They Say" in 1993). A second video, "The Stars (Are Out Tonight)", was released February 25. Directed by Floria Sigismondi, it stars Bowie and Tilda Swinton as a married couple. 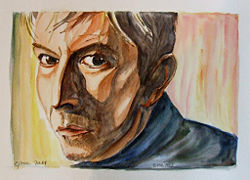 Bowie wrote and recorded the opening title song to the television series The Last Panthers, which aired in November 2015. The theme was also the title track for his January 2016 release Blackstar. Bowie's first major film role in The Man Who Fell to Earth in 1976, earned him critical acclaim as an actor. In the 1980s, Bowie continued with film roles and also starred in the Broadway production of The Elephant Man (1980-1981). Bowie also starred in The Hunger (1983), a revisionist vampire movie with Catherine Deneuve and Susan Sarandon. In Nagisa Oshima's film Merry Christmas, Mr. Lawrence (1983), Bowie played Major Jack Celliers, a prisoner of war in a Japanese internment camp. Bowie also had a minor role as Colin the hit man in the 1985 film Into the Night. The rock musical Absolute Beginners (1986), was both a critical and box office disappointment. He fared better in the same year when he appeared in the Jim Henson cult classic Labyrinth (1986), playing Jareth, the king of the goblins. He also played a sympathetic Pontius Pilate in Martin Scorsese's The Last Temptation of Christ (1988). Bowie portrayed a disgruntled restaurant employee opposite Rosanna Arquette in the 1991 film The Linguini Incident, and played mysterious FBI agent Phillip Jeffries in David Lynch's Twin Peaks: Fire Walk with Me (1992). He took the small but pivotal role of Andy Warhol in Basquiat, director Julian Schnabel's 1996 biopic of the artist Jean-Michel Basquiat. In 1998 Bowie also co-starred in an Italian film called Gunslinger's Revenge (renamed from the original Il Mio West). Before appearing in The Hunger, a TV horror serial based on the 1983 movie, Bowie was invited by musician Goldie to play the aging gangster Bernie in Andrew Goth's movie, Everybody Loves Sunshine. He played the title role in the 2000 film, Mr. Rice's Secret, in which he played the neighbor of a terminally ill 12-year-old. In 2001, Bowie appeared as himself in the film Zoolander. In 2006, he portrayed Nikola Tesla alongside Christian Bale and Hugh Jackman in The Prestige, directed by Christopher Nolan. Bowie has voice-acted in the animated movie Arthur and the Minimoys (known as Arthur and the Invisibles in the U.S.) as the powerful villain Maltazard. He also appeared as himself in an episode of Extras. He lent his voice to the character "Lord Royal Highness" in the SpongeBob SquarePants episode "SpongeBob's Atlantis SquarePantis." His also took a supporting role as Ogilvie in the 2008 film August. He also previously declined the British honor Commander of the British Empire in 2000, and knighthood in 2003. Bowie's innovative songs and stagecraft brought a new dimension to popular music in the early 1970s, strongly influencing both its immediate forms and its subsequent development. 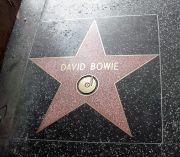 A pioneer of glam rock, Bowie, according to music historians Schinder and Schwartz, has joint responsibility with Marc Bolan for creating the genre. At the same time, he inspired the innovators of the punk rock music movement—historian Michael Campbell calls him "one of punk's seminal influences". While punk musicians trashed the conventions of pop stardom, Bowie moved on again—into a more abstract style of music making that in turn became a transforming influence. Bowie was inducted into the Rock and Roll Hall of Fame in 1996. Through perpetual reinvention, his influence continued to broaden and extend. In 2000, Bowie was named by NME as the "most influential artist of all time." This page was last modified on 13 November 2017, at 23:54.